Clare Teal and Frank Renton present the exciting climax to our search for the next brass star live from Royal Northern College of Music. Clare Teal and Frank Renton present the exciting climax to our search for the next brass star live from Royal Northern College of Music Manchester. 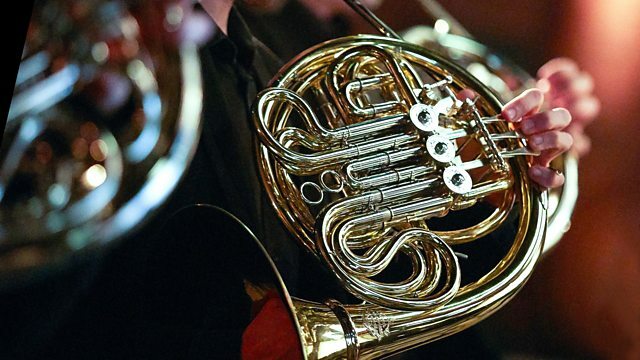 Trombonists Ellena Newton and Isobel Daws, Flugel player James Nash and Siobhan Bates on Tenor Horn are all accompanied by the world famous Foden's Band and conductor Michael Fowles as they play to take the Award for 2017. During the adjudication we hear Foden's in concert including a song by Clare Teal, The Overture to Candide by Leonard Bernstein and Slaughter on 10th Avenue, the rarely heard ballet music from On Your Toes by Richard Rodgers. After a reprise from the winner Foden's end the night with the classic Innuendo by Freddie Mercury. Performer: Evelyn Glennie. Performer: Black Dyke Band. Performer: Eikhanger-Bjorsvik. Performer: Howard Snell. Music Arranger: Howard Snell. Performer: Cory. Conductor: Philip Harper. Performer: Cory Band. Performer: David Pritchard. Composer: Kern. Performer: Grimethorpe Colliery Band.